Ciwt has a movie chat friend who wrote to tell her Blaze is a 'near perfect' movie and she should see it. It's an account of a songwriter, Blaze Foley, as told by his friend and fellow Texas blues musician, the lateTownes Van Zandt. Ciwt's friend wrote: I can't say enough good things about this movie. The music is moving and gorgeous, the narrative is complex, the central character honest, broken, lovable and doomed. It's indie filmmaking at its best. Rotten Tomatoes top critics loved it too, so how could she not go? Impossible, so go she did and as she watched she was impressed with the overall filmmaking. 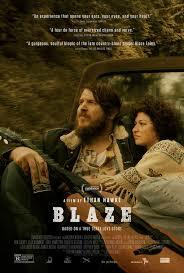 In this 'year of Ethan Hawke' he has done a superlative job directing Blaze. The movie is all Ciwt's friend says, but Ciwt found it downbeat, a downer and downright depressing. As she watched, she remembered her friend is a Creative Consultant to artists, many of whom are musicians so of course he would find all the scenes of the long movie engaging, true and necessary. He's also a poet who often recites his work accompanying himself with blues piano. He knows the scene. That isn't Ciwt. Individual guitar players just kind of hanging out, picking at their guitars and drawling about life's sadnesses pretty much put Ciwt's feet to sleep. So Blaze's - the man and the movie - great music was mostly lost on her. That left watching 'doomed' talents go to the places - tragedy and death - of their songs. Even perfectly acted, shot, directed and told, that was sad fare for Ciwt.